← Hallmark TV Movies – How Life is Supposed to Be! This entry was posted in Book Reviews and tagged British Library Crime Classics, Death of a Busybody-George Bellairs, Detective Inspector Thomas Littlejohn, Mystery. Bookmark the permalink. 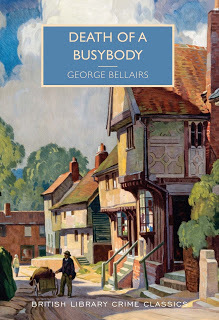 5 Responses to Death of a Busybody – George Bellairs – WHO? Thanks for introducing me to this author, Stepheny. Looking forward to reading his books! Let me know what you think. Another author in your queue. I’ll check out this author. Thanks for the review, Stepheny. I’ve been on a cozy kick since trying to write one myself. And I love English village settings too. I repeat, what would we do without our books. Happy reading. Stepheny – can’t explain it but found myself looking up your name. Didn’t know about Bob. Always grateful for the time we knew one another across the years. I was in KY visiting in 2017 & had the odd experience of finding myself on the street in Prispect where I once lived.